Rick Franklin and Michael BaytopRick Franklin was born in Washington DC on 16th March 1952 and learnt his blues from the same regional musical mix as Baytop. Following a brief flirtation with electric blues he was turned onto the music of the numerous artists who had migrated from Virginia and the Carolinas to settle in the Washington area. Amongst these was the aforementioned Archie Edwards together with Warner Williams, John Jackson and John Cephas. Listening to these artists then led to him searching out records by their mentors Blind Blake, Blind Boy Fuller, Dan Stokes and the Rev Gary Davis. For nigh on 30 years Rick has honed his skills in clubs, farmers markets and blues roots festivals. For a number of years he worked as part of a �good time blues trio� called Franklin, Harp and Usilton, who recorded a CD of Hokum, Ragtime and Jug Band material. Lately he has recorded a CD with Michael Baytop which will be available at the concert. A rare cassette of early solo material is reputed to exist and hopefully he will be carrying a copy of this with him. In his spare time Rich teaches guitar techniques and at one point organised an educational blues programme for schools with Archie Edwards and John Jackson. 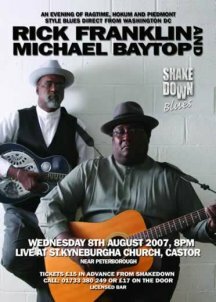 Michael Baytop was also born in Washington DC on the 3rd September 1948. His parents enjoyed Rhythm and Blues and his father played harmonica. Michael, however, showed no real interest in music until inspired by Archie Edwards, a local blues singing barber who played both guitar and harmonica. Edwards agreed to teach Michael to play the guitar and harmonica. On this latter instrument he was also influenced by Charlie Sayles and Phil Wiggins. Michael was quick to learn and was soon playing in the local folk clubs. In the mid 90�s Michael eventually went on the road with Archie Edwards and his sidekick Richard �Mr. Bones� Thomas - a percussionist whose specialty was �spoons and bones�. After Archie�s death in 1997 he performed and recorded with his friend Mike Roach and since then has played numerous Blues Roots Festivals including the famed �Bull Durham Blues Festival, The Blues in The Burg Festival in Fredericksburg, VA, the prestigious Smithsonian National Folk Life Festival and the renowned Ferrum College Festival.